Crouch End’s name is of Middle English origin, an ‘end’ being an outlying place, while a ‘crouch’ was a cross, which may have been placed here as a boundary post between two manors. During the late 18th century the village took shape as a congreg­ation of labourers’ cottages, though there were grander houses in the vicinity – two of which were later acquired by the Booths, the gin distilling family. The Hornsey enclosure award of 1813 prompted a gradual programme of house­building that accel­erated rapidly after the opening of Crouch Hill and Crouch End stations in the late 1860s. The latter has since closed and its disused line has become the Parkland Walk that traverses the district. During the 1870s and 1880s Crouch End was entirely built over, with pressure from local worthies ensuring a high standard of construction. 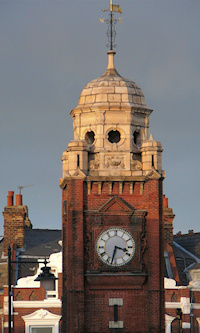 Civic pride shows in Crouch End’s landmark, a clock­tower erected by public subscription in 1895. Hornsey town hall was built on the Broadway in 1935 and bears a resemb­lance to Tate Modern (which began its life as a power station). A few post-war office blocks have marred its homogeneity, but Crouch End remains one of London’s lovelier suburbs, with an eclectic selection of shops and restaurants in the streets converging on the Broadway. Hornsey College of Art, attended by the Kinks’ frontman Ray Davies, later became the TUC College. Since 2008 the building has formed part of Coleridge primary school. Early in the 21st century the old telephone exchange was replaced by an apartment complex with a fitness centre and a Marks and Spencer food store at street level. Haringey council declared Hornsey town hall surplus to its require­ments in 2003 and it lay empty for several years after­wards. The Mountview Academy of Theatre Arts hoped to move in but its plan failed to come to fruition, so the Hornsey Town Hall Creative Trust is presently working with the council to consider a range of long-term devel­opment options for arts and learning. In the meantime, an interim community project is making use of several parts of the building. The former Salvation Army Hall on Tottenham Lane is now the Arthouse, a multi­cul­tural, multi­media, multi-genre cultural venue. Despite its outward gentility, Crouch End – according to Stephen King’s short story of that name – hides a gateway to a nightmarish parallel dimension behind its “elderly brick houses like sleepy dowagers.” The story has been republished in the collection Nightmares and Dreamscapes. 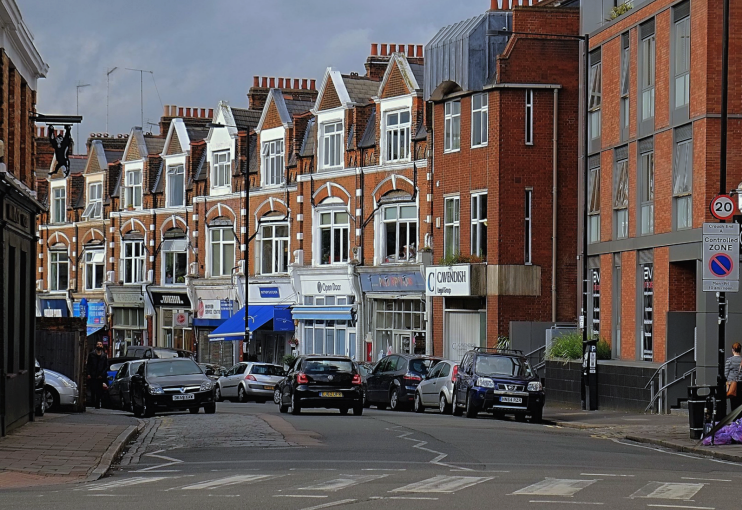 * The picture of Middle Lane, Crouch End, at the top of this page is adapted from an original photograph, copyright Julian Osley, at Geograph Britain and Ireland, made available under the Attribution-ShareAlike 2.0 Generic Licence. Any subsequent reuse is hereby freely permitted under the terms of that licence.